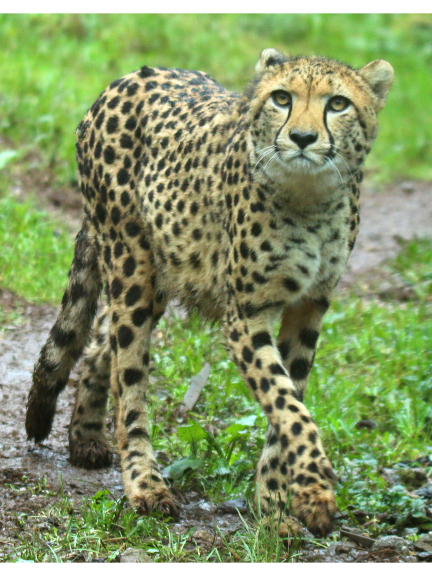 Paignton Zoo is now home to three cheetah: two year old Jahzara joins male Kasai, who is 11 and female Isantya, who is 4. Cheetah live on average between 8 and 12 years in zoo collections. Breeding cheetah is notoriously difficult. Zoos across Europe work together, swopping animals, pairing them in different combinations and placing them in different enclosures in the hope of stimulating them to breed. The cheetah (Acinonyx jubatus) is listed as Vulnerable by the IUCN. Threats include the loss of habitat and the decline of prey species; conflict with people; the illegal pet trade; competition with other carnivores; and a gene pool with very low variability. Cheetahs can run at up to 120 km/h (75 mph), faster than any other land animal. Paignton Zoo Environmental Park is a registered charity. For more information go to www.paigntonzoo.org.uk or ring 01803 697500.